Elegance, beauty, admiration and respect, purple orchids are one of the beautiful flowers that can steal anyone’s heart. 5 purple orchids are wrapped in pink paper packing along with a ribbon bow. You can present this bouquet on any occasion like birthday, anniversary, propose day, Valentine day and many more. 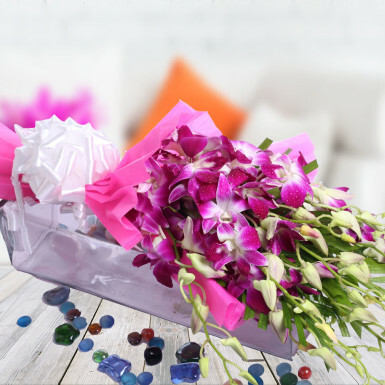 Spread the fragrance of love in your loved ones life by sending this bouquet from Winni. Go ahead and place your order now!